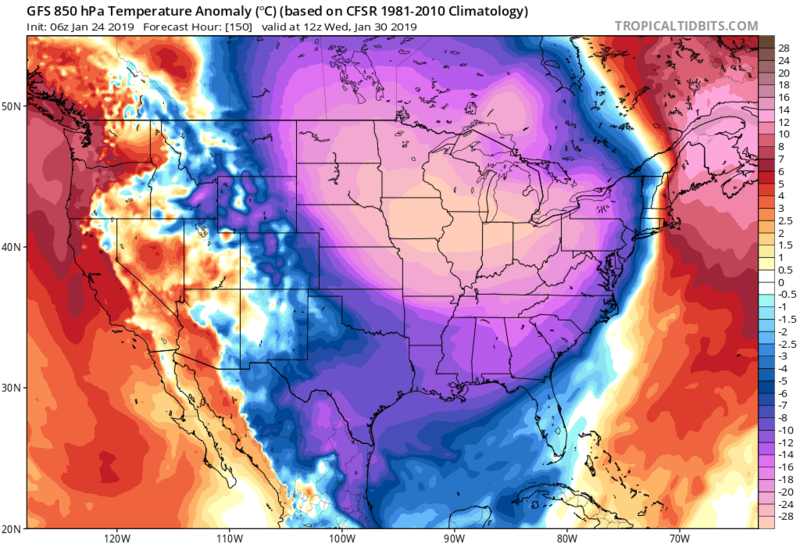 Although confidence is not 100% yet, confidence in the forecast for some incredibly cold temperatures to hit central parts of the states from early to mid week (next week) is increasing. Both the GFS and ECMWF American & European computer models are agreeing on a shot of severely cold Arctic air reaching central Canada early next week before hitting the great plains and mid west from Tuesday on wards – before spreading east later in the week. Don’t get us wrong though it will be a fairly cold weekend for the plains, mid west and north east this weekend with temps just slightly below average. Next week though is when a big chunk of the PV (Polar Vortex) could dive south into these central and eastern parts of the US increasing the risk of “life threatening” cold. After a chunk of life threatening cold hit the upper North East earlier this week associated with a blockbuster snowstorm, the cold next week could be as or even more severe than this. Many areas stretching from North Dakota to Chicago are forecast to see highs several degrees below 0 if this cold spell verifies, with the unusually cold air spreading towards the east coast towards the end of the month (mid to late next week). There is also quite a bit of snow in the forecast with “Northerly clippers” forecast over the next 5 days for the great lakes, upper north east bringing the odd fall of 2-6 inches locally. There’s the potential for a more significant swathe of snow next week associated with the severe Arctic outbreak. This depth of cold is very unusual and will have a variety of disruptive consequences including potential power outages, cell service outages and water supply issues. This is not your ordinary winter cold snap, it’s one of those severe ones that hit every 2 to 3 years, and you should keep a VERY close eye on the forecast as this depth of cold is more severe than a blockbuster snowfall due to the risk to life it poses. If the forecast verifies keep a close eye on the vulnerable people in your community. And keep an eye on local forecasts that monitor this developing risk. We say risk, because this is currently put at around a 70% chance of verifying. So that 30% is still there, but it’s relatively small. Stay informed. This entry was posted in Uncategorized on January 24, 2019 by admin8. A shot of brutal cold is likely next week in the US and will likely crank up the lake effect snow machines. Temperatures at 5,000ft of -30C or less will likely lead to brutal surface cold conditions for a large portion of the Mid West & Great Lakes. This entry was posted in Uncategorized on January 23, 2019 by admin8. After a colder spell during the last 24 to 36 hours, things are set to be fairly nondescript over the next few days. Although Friday will be slightly milder across the UK, things will become colder again later on Saturday and into Sunday. The colder temperatures will last into Monday to. It will be cold enough for a risk of some UKSnow for inland areas, but at present this is just a risk and finite details will become refined over the next few days. 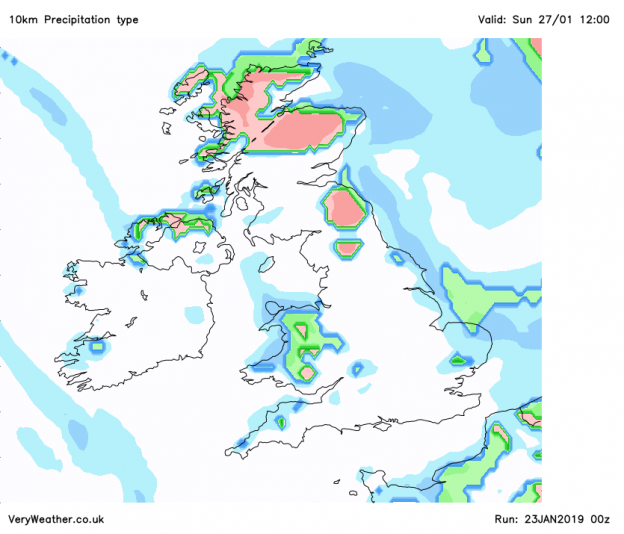 An active cold front will sweep south on Saturday through the UK and Ireland, bringing with it some heavy rain for most areas and also a risk of some snow. 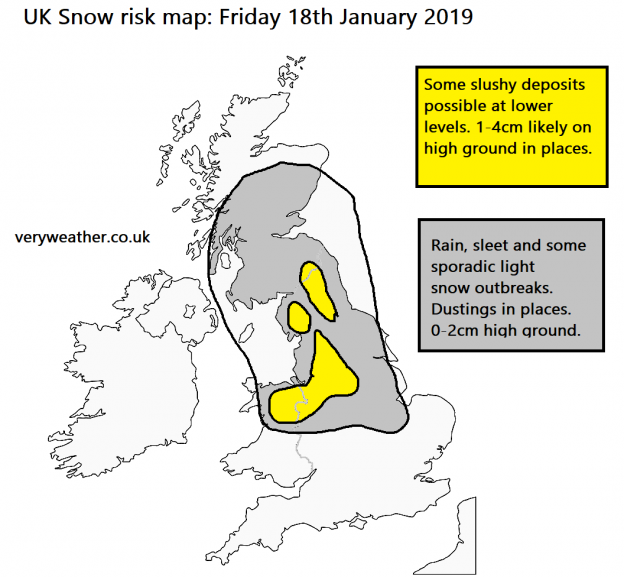 That snow risk is higher further north, for places like the Peak District, northern England, and also for places with elevation (high ground). However as this is a few days away still, the details are not refined on yet – there is some uncertainty. Following this cold front is cold Arctic air that will flood the UK later on Saturday and into Sunday, bringing a widespread frost and also some snow showers for northern Scotland, Northern Ireland and Irish Sea Coasts. Winds will also be very strong on Saturday and into Sunday, northerly gales bringing the risk of drifting snow where it falls. There could be a spell of gale force winds even across central and southern England and Wales on Saturday evening – again the details regarding this are uncertain to stay tuned to the forecast. Looking further ahead, uncertainty increases as it always does the further out you look. However it’s likely that next week will be a week with temperatures colder than average (60% chance) with only a 40% chance of average or milder than average temperatures. It looks pretty unsettled, with strong winds at times and also a lot of precipitation. Of course with cold temperatures and precipitation, comes a risk of snowfall. This risk is more pronounced for northern areas and on high ground, however there’s a chance of some snowfall just about anywhere. Bear in mind this is only a chance and things could still change. We recorded 18 inches of snow as a storm total in Glens Falls, New York state, and although the next winter storm (named “Indra”) wont be packing the same punch as the previous winter storm “Harper”, it will still have it’s own dangers. The NWS has issued a Blizzard Warning, the highest level of winter warning issued from their department, for central north eastern parts of Colorado and the far NW of Kansas, as well as the southwestern most county of Nebraska. Blizzard conditions are imminent here with strong winds and high snowfall totals combining to bring extremely challenging or immobilizing travel conditions! Rates of over 1″ per hour are currently affecting these areas and will ease in the next 6 to 18 hours. The focus for heavy snowfall then shifts further north east through the plains into Iowa, Wisconsin and the great lakes in the next 12 to 36 hours. Snowfall rates of 1 to 3 inches per hour will cause challenging driving conditions for parts of southern and eastern Iowa, the far NW of Missouri overnight tonight before swathing into southern Wisconsin, central Michigan with rates widely of 2-3″ per hour into later on Wednesday which is where we could see close to a foot building up. 10 inches seems possible far NW of Illinois into southern Wisconsin. Snowfall totals: our Winter Storm IDRA risk map gives an indication of who and where will receive the most snowfall from this event. This entry was posted in Uncategorized on January 22, 2019 by admin8. As of quarter to 4pm snow has been reported to be falling at London Heathrow Airport and also in South Buckinghamshire,. 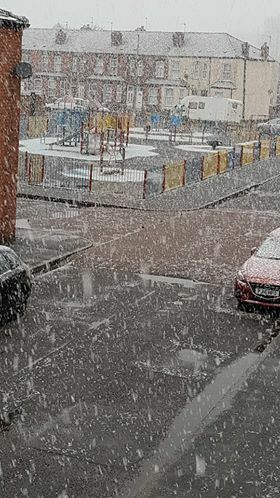 Many parts of the Midlands, especially the North Midlands around Stoke have currently got snow. This snow is expected to slowly head east over the next few hours bringing parts of the East Midlands, Lincolnshire and Eastern England a spell of moderate wet snow and sleet this afternoon and evening. Some areas could see 1-3cm of wet accumulation locally, with more to high ground. However near coasts and in large urban areas snow will really struggle to settle. Given that this is very wet snow, and that isn’t forecast to be particularly heavy, there isn’t a great deal of disruption expected from this. 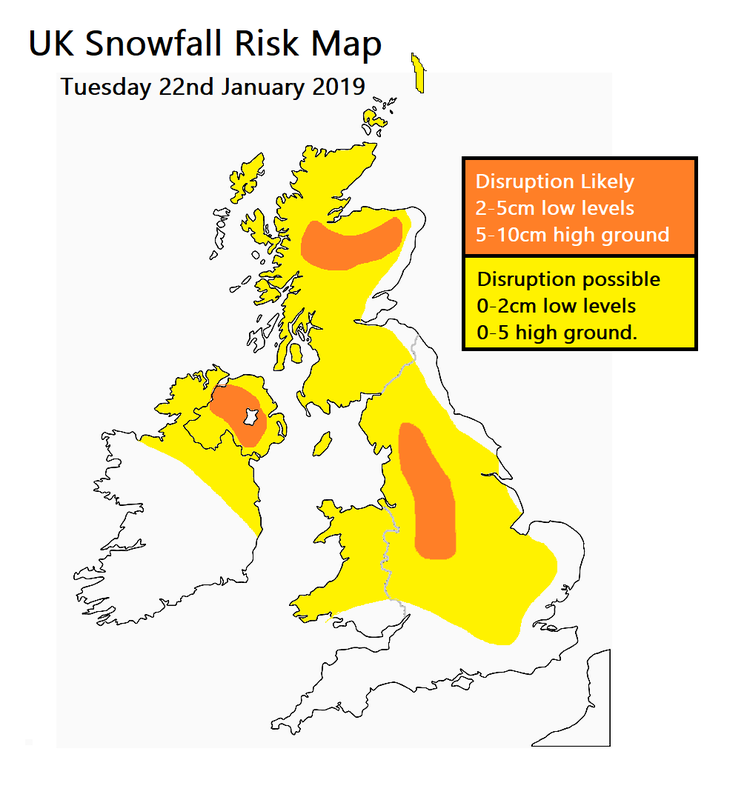 The Pennines, Northern Ireland and Scottish Hills will be most prone to any disruption from snow in the next 48 hours whilst elsewhere there will be some snow, but it will mostly be hit and miss. We have outlined where we expect there could be some “surprise snowfall” across central and eastern areas in the next 4 hours or so. Once this clears overnight many inland areas that had wintry showers today will turn dry, and cold, with the risk of some icy patches into Wednesday. Once again tonight wintry showers will continue around northern and western coasts, with a mixture of rain, sleet, hail and wet snow to lower levels and sleet and snow to high ground. Later in the night though these showers will become increasingly sporadic and isolated in nature, meaning if you do become stuck under them, then you are one of the unlucky. 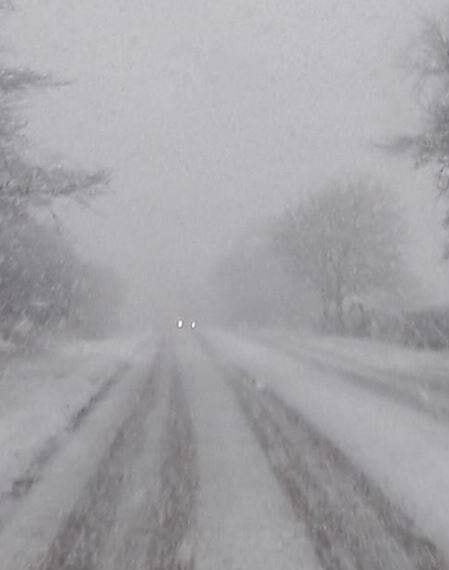 Looks rough in Leek (Via Dannii). 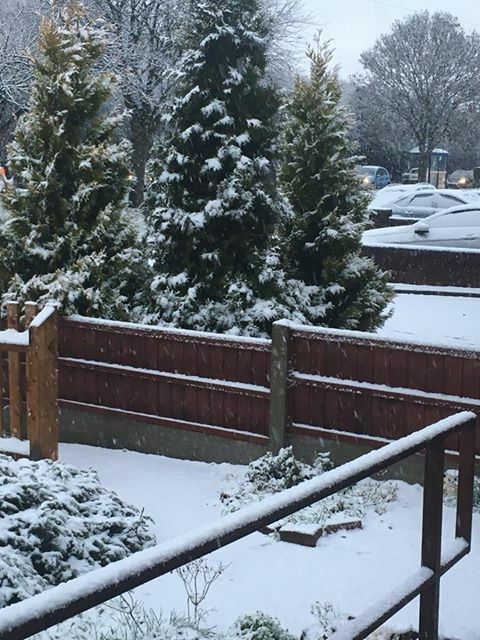 Snow has even been reported in some of the suburbs of London! The scene in Derbyshire is improving as snow showers have cleared, however as snow is now heading into the central and southern peak district and into Stoke on trent, Some roads such as the A53 Leek road and A57 Snakes pass may remain a little tricky, but overall in the peaks the situation is improving. 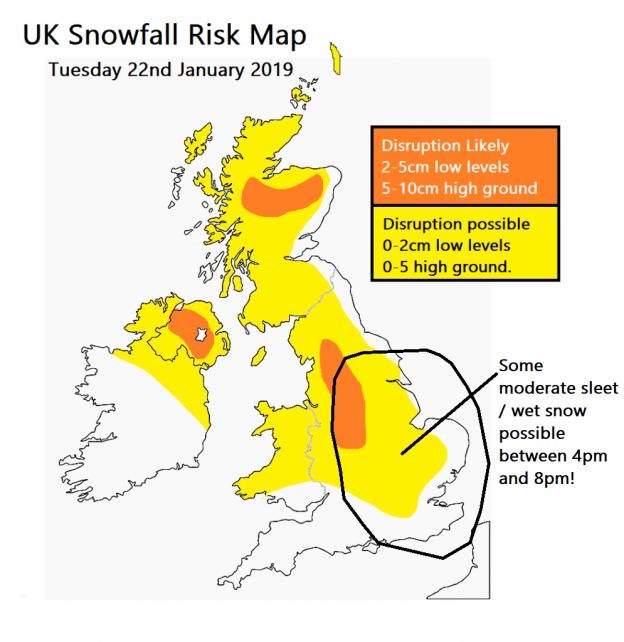 The focus has shifted to the midlands and eastern England for some isolated bursts of moderate or even heavy (ish) snow this evening! Watch out for plummeting temperatures tonight though and a risk of ice. A cold north westerly air flow is really digging in that colder air across many parts of the UK at the moment with a mixture of rain, hail, sleet and snow showers for many northern areas. Sporadic wintry showers will continue to affect western and northern Scotland and Northern Ireland, giving 2-5cm in places. Further south the forecast is more complicated, with an organized band of showers currently forming in the Irish sea and heading east. It’s likely that some parts of North West England including Manchester, and later the Peak District will be affected by some heavy wet snow this afternoon giving a sporadic 2-5cm with 10-15cm in places across the high ground of the Pennines. Parts of Wales will also get some snow from this. Later into the afternoon the snow will progress into parts of the Midlands again giving some patchy snow accumulations. Certainly one to be aware of if travelling this afternoon. By this evening and overnight, snow shower activity will become more sporadic in nature, giving isolated snow accumulations for central, northern and western Scotland, NW England, Wales and parts of the north of Ireland. Here 2-5cm could fall locally. Ice will be a significant risk tonight with temperatures dropping to or below freezing. This entry was posted in Uncategorized on January 18, 2019 by admin8.